Last week I had a real hankering do get some pho for lunch. There is this great place (finally) near where we live called Pho King. They have some of the best pho in town, in my opinion, and as I was pulling into the plaza, I noticed a new shop called Lucky’s Chinese Bakery. I had to stop in, and boy was I glad I did. This place was full on busy with Chinese workers slinging all sorts of stuffed buns. There was whole roasted duck sitting in front of me, along with char siu and crispy roasted pork. I thought I was in heaven for a second, but then I snapped out of it and began ordering. I ordered both porks, and a few buns, then went home to sample everything. EVERYTHING was really, really good. I had plenty of char siu, a style of sweet barbecue pork that is chopped up, leftover, and as I was making pizzas on my Kettle Pizza, I decided to come up with a char siu pizza. It was great. Pretty basic stuff, but the great thing, at least in my opinion, is that you get that sweetness from the char siu that is balanced by that subtle heat from the jalapenos. A perfect marriage in my opinion. Heat your oven to the highest temperature, with a pizza stone. In my case, I use the Kettle Pizza, which I think I have mastered pizzas now, and again get it up to the highest temperature. I find that around 620 degrees, in that area is a great temperature to get a pizza cooked in a matter of minutes. While your stone is heating up, make the pizza. Lightly dust a pizza peel with the cornmeal. Shape your dough and lay it onto the peel. 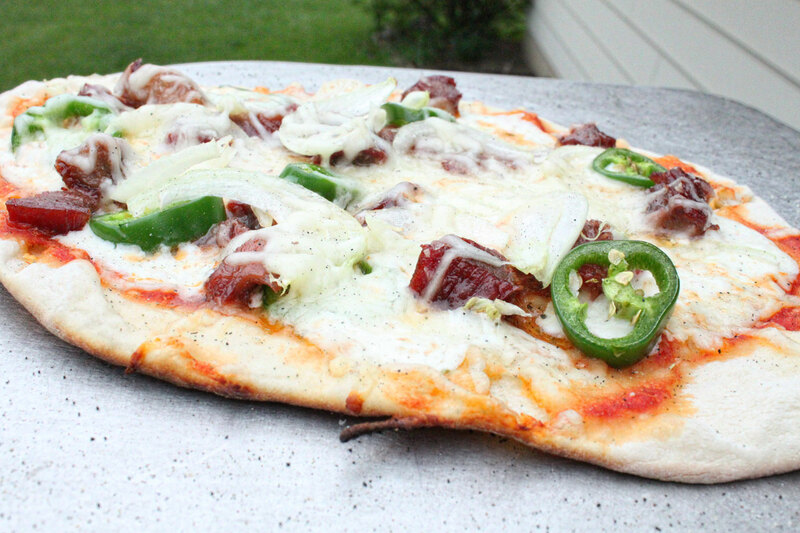 Lightly toss on the sauce, cheese, onions, jalapenos, and sliced char siu. Slide the pizza off of the peel onto the hot stone, and cook for a couple of minutes. Once the dough begins to cook, in my case pretty quickly, take some tongs and turn it 45 degrees to prevent any hot spots. Once cooked to your liking, remove it from the stone, and slice and serve. I love experimenting with new pizza ingredients, and this one was no exception. It was perfectly balanced in flavor and I will make it again if I have any leftover char siu. Hope you enjoy! Char Siu or as I know it as "Pink Pork"